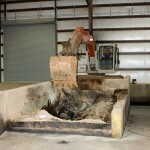 STAT INC. now offers solidification services for your liquid waste disposal needs. 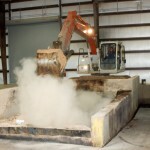 Our state of the art solidification facility is designed to mix liquid waste with a compound that creates a solid waste that is legal to be disposed of in a landfill. The solidification pit is comprised of a 30 Mil Plastic Liner under 12” of 5,000 PSI concrete with 5/8” rebar all tied on 6” monolithic poured centers. A 1/4” steel tank sits inside this concrete vault and is used to mix the liquids with the compound to create the solid waste product. All of this resides in our 100’ X 75” metal building. The building also has a 25’ x 30’ loading dock to facilitate easy loading and unloading.